Join us this Spring & Summer to meet the instruments of the orchestra, improve development through play and explore the amazing music of our country! 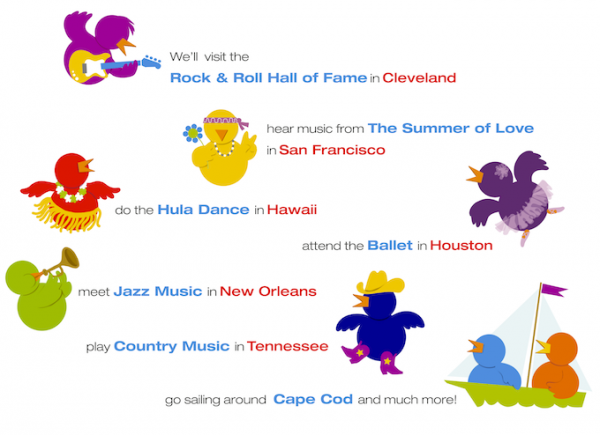 Our Spring/Summer curriculum is a cross-country musical adventure! Each week in our classroom, we "travel" in our VW bus with our puppet friend Carly Crocker to find a new genre of music. Rock, Country, Classical, Broadway, Motown, Folk, Hula, kids songs and much more. As always, our music classes help children 0-5 reach development milestones through play!